Patients and medical professionals alike are slowly growing into the digital advances that are revolutionizing the ways that medical records are maintained in addition to the delivery of healthcare services. As technology continues to advance, so do the applications of technological innovation within the healthcare sector. 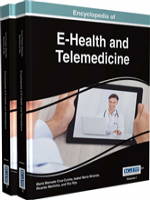 The Encyclopedia of E-Health and Telemedicine is an authoritative reference source featuring emerging technological developments and solutions within the field of medicine. Emphasizing critical research-based articles on digital trends, including big data, mobile applications, electronic records management, and data privacy, and how these trends are being applied within the healthcare sector, this encyclopedia is a critical addition to academic and medical libraries and meets the research needs of healthcare professionals, researchers, and medical students. This manual exhibits a coverage of a multitude of topics such as Cyber-Physical Systems, Electronic Health Records, Gamification, Health Monitoring, Home Healthcare, M-Health, Medical Devices, Medical Imaging, Security and Privacy, Technology-Assisted Medical Education and TeleHealth.